This note supplements an article on ‘Organising a three-way referendum’ published on The Economist website (16th January 2019). It offers a worked example to show how the three main approaches to three-way ballots operate and some of the challenges they throw up. It reinforces Ken Arrow’s result that there is no ideal way of combining individual preferences to select one of three options. This ordering solves the fundamental flaw of the referendum in June 2016—that no-one knew what “leave”’ meant. It is clearly preferable to the alternative ordering which asks first whether you want to leave and then later (or at the same time) which leave option you prefer. (2) An alternative vote, which has all three questions on the ballot and asks voters to indicate their first choice and, if they wish, a second one. If one option receives 50% of the votes, it wins. Otherwise, the question receiving the fewest first preferences is eliminated and its proponents’ second choices are distributed over the remaining options. The one that has most votes after this is the winner. (3) A Condorcet vote, named after an eighteenth-century French philosopher, consists of a single ballot that runs three, two-way races: A vs B, B vs C and C vs A. If we have three options on the ballot, there are six possible orderings that an individual might have. These are given in Block (I) of the table and for concreteness, each is labelled with the name of a Conservative minister whose words or actions suggest that they would adhere to that ordering. Thus, for example, John Redwood, having long opposed the EU, clearly prefers ‘no deal’ to ‘deal’; Ken Clarke, on the other hand, would like to ‘remain’ but accepts ‘deal’ as the politically responsible thing to do. Boris Johnson and Justine Greening have both declared the PM’s deal to be the worst of both worlds. 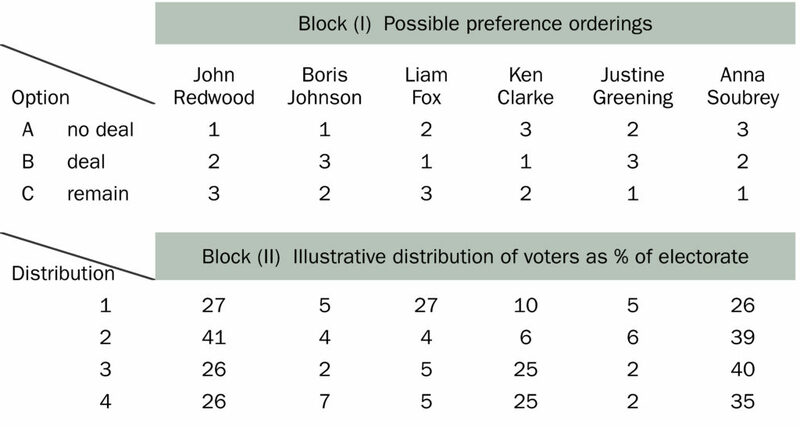 Block (II) of the table gives four entirely fictitious distributions of voters (in percent) across orderings; it is not intended to imply any judgement about actual preferences in the UK. Distribution 1 has the electorate gravitating towards ‘deal’ as a compromise (Mrs May’s dream outcome). 37 percent prefer ‘deal’ (Foxes + Clarkes) to 32 prefer ‘no deal’ (Redwoods + Johnsons) and 31 prefer ‘remain’ (Greenings + Soubreys). ‘Deal’ wins in all three vote formats. 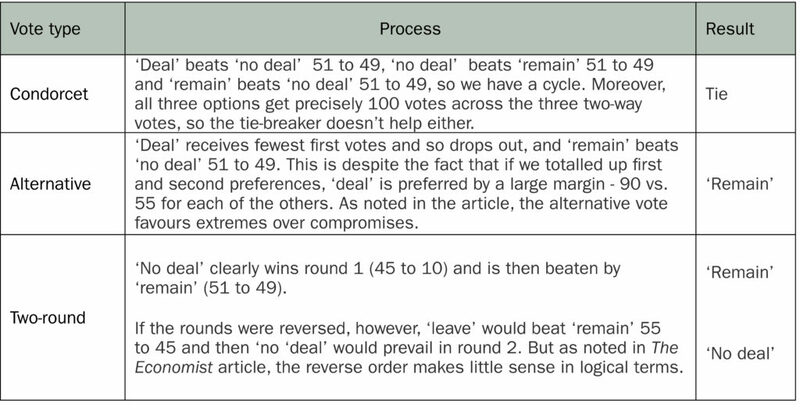 Distribution 2 is much more extreme, with 45 percent preferring ‘no deal’ to 10 for ‘deal’ and 45 for ‘remain’. Distribution 3 has ‘remain’ as the favoured single option, but still with not enough preferences to beat the combined ‘leave’ positions. Distribution 4 just shows that gaming is possible in the alternative vote. It is distribution 3 except that 5 Soubreys pretend to be Johnsons. Now ‘deal’ has fewest first preferences (30) and is eliminated and, after redistribution, ‘remain’ beats ‘no deal’ by 62 to 38. But, of course, distribution 4 could arise from genuine preferences, in which case we see that different rules for the three-way ballot imply different outcomes. Part A: Would you like to remain in the EU or leave the EU? Part B: If it is decided that the UK is to leave the EU, would you like to leave with no deal, or Theresa May’s deal? Of course, you can argue that Part A is too vague in that it is not possible to know what you mean by “leave the EU”… but that’s exactly the question we had in 2016! And anyway it is actually now asking if you prefer “remain” to [either “no-deal” or “Theresa’s deal”]. Which is superior, in my mind, to the 2016 question. The above 2-part question seems logical to me, is pretty easy for laypeople to understand, and could be organised in less time. In addition, it would suit people like me down to the ground as I am someone who dislikes Theresa May’s deal so much that (although my STRONG preference is to remain) I would rather no deal than her deal. Such a question, therefore, would give me enough room to express the nuances of my preferences. This supplementary note is key, as in the main comment you do not call out that the different methods may result in wildly different outcomes and, thus, choice of method may become the main issue of contention. Given that senior politicians could gain access to detailed results of significant opinion polls, that basically run as mock referendums under different methods or just establish good estimates of the voter preference distribution, they would then argue their preferred method and do so disingenuously – claiming moral superiority but with expedient real motives. Some commentators might even argue for a referendum on which referendum method should be used and … oh no … for this you also suggested three options – so we need one more referendum on the method for holding the referendum on the method of the final referendum!